Edited by Sander Bax, Pascal Gielen, Bram Ieven. Text by Sander Bax, Bojana Cveji´c, Lieven De Cauter, Pascal Gielen, Odile Heynders, Bram Ieven, Vanessa Joosen, Jenniffer Miller, et al. Can art intervene in the public sphere? Interrupting the City explores the ways in which artistic practices and interventions intersect with the public sphere. The tactics by which an intervention is achieved may vary, ranging from a media offensive to a riot in the streets, but each time these activities affect the flow or circulation of urban public space, they also reconstitute it. Interrupting the City, edited by Sander Bax, Pascal Gielen and Bram Ieven, proposes the public sphere as a network of social, political and economic forces in constant flux, and attempts to chart the conditions under which art can contribute to or interrupt this process of the construction of public space. 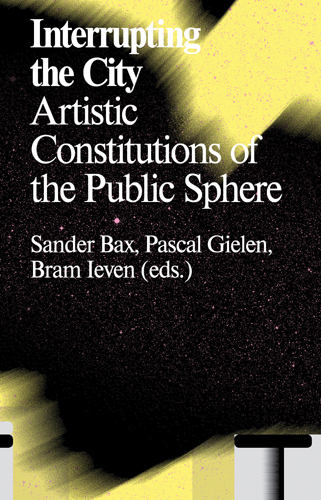 This volume brings together a range of internationally renowned theorists and artists to consider the relations between artistic activity and public space, and proposes how artists can develop their voices in the public sphere.